As a newborn, Roneisha Pugh was placed in the care of a grandfather who looked after her until he died of complications from AIDS. Pugh and her brothers were then sent to live with an aunt who cared for them until she died of cancer. That tragedy left Pugh and her brothers at the mercy of her aunt’s alcoholic husband who, Pugh says, was physically and mentally abusive. But Pugh, who lives in Inglewood, was determined to succeed. So she moved out of her uncle’s home and found the love and support she needed with extended family. She went from nearly failing out of school to being among the top 15 students in her class now at St. Mary’s Academy. She won an award for her dedication to community service, and is now focused on going to college and becoming a doctor. 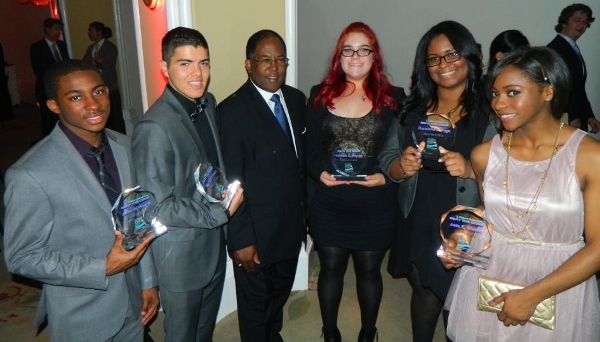 Pugh was one of five teens awarded with the 2012 Beat the Odds $10,000 scholarship sponsored by the Children’s Defense Fund at its 22nd Annual Gala in Beverly Hills. The Beat the Odds Scholarship and Leadership Program provides high school students with a college scholarship and numerous support services, including mentoring, internship placements, leadership development, college counseling, and SAT prep. More than 450 education supporters including Los Angeles County Board of Supervisors Chairman Mark Ridley-Thomas, Children’s Defense Fund President, Marian Wright Edelman, a wide range of Hollywood entertainers, and community organizers attended the event. But the real stars of the evening were Pugh and Yahydia Iñiguez, Richard Kent, and fraternal twins Jade and Jalen Woods. One-by one, an emotional documentary based on the life of each recipient was shown before the large crowd followed by an award presentation. Fraternal twins, Jade and Jalen Woods, have drawn strength from each other. At the age of four Jade and Jalen’s parents separated, forcing their mother to move them to a shelter in Arizona. When they returned to California bouncing from their mother to their father, the bitterness between their parents made it difficult to remain focused in school. But the siblings pulled through and today they are leaders in their community. Jade is the Chairperson for the Children’s Defense Fund- Los Angeles Youth Policy Advisory Committee. Jalen, a star athlete, has earned more than 45 trophies and MVP awards for basketball. The two, who attend Frederick K.C. Price III School in South Los Angeles, maintain grade point averages above 4.0. and are eager to go to college.